Thank you for visiting the newly renovated Holiday Inn Express Hotel & Suites- Dayton Huber Heights. 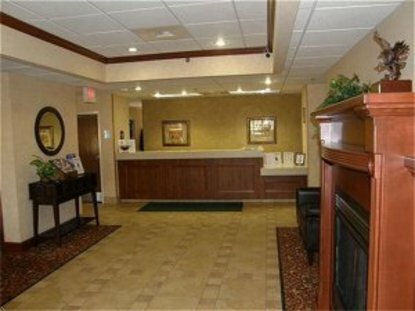 The Holiday Inn Express Hotel & Suites- Dayton Huber Heights is easily accessible from both I-70 and I-75. We are just 6 miles east of the Dayton International Airport. The Holiday Inn Express Hotel & Suites- Dayton Huber Heights is located within walking distance of several restaurants, which includes TGI Fridays who does offer our guest a 10% discount. Minutes away from the United States Air Force Museum, Wright Patt Air Force base, Wright State University, Miami Valley Hospital and University of Dayton along with many other local interests. We are conveniently located near many area companies such as Trimble, Aida, ABF, Bowser Morner, Beta Laser Mike, Delphi, General Motors, Dayton Frieght, FedEx and many more. Not only did we add the new hot Express Start breakfast but all rooms were also updated in January of 2008. The renovations include: new furniture, new and brighter lighting, all new granite bathroom vanities, beautifully framed mirrors, and all new curtains and to think that does not even include what we've done to our public areas. We also offer a meeting room for you and your associates. The meeting room can fit up to 45 people, perfect for a meeting, family gathering or shower. Need catering, let us take care of it for you. We also offer you a 24-hour business center. We look forward to seeing you soon This hotel is committed to providing accessible facilities under the American Disabilities Act. If your accessibility needs are not met, please contact the Hotel Manager on Duty. Should you require additional information regarding accessible facilities for guests with disabilities, please call 1-800-Holiday (U.S. and Canada) or contact the hotel directly. For the hearing impaired, TDD service is available at 1-800-238-5544 within the U.S. and Canada.